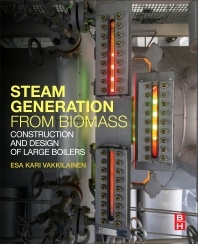 Steam Generation from Biomass: Construction and Design of Large Boilers provides in-depth coverage of steam generator engineering for biomass combustion. It presents the design process and the necessary information needed for an understanding of not only the function of different components of a steam generator, but also what design choices have been made. Professor Vakkilainen explores each particular aspect of steam generator design from the point-of-view of pressure part design, mechanical design, layout design, process design, performance optimization, and cost optimization. Topics such as fuels and their emissions, steam-water circulation, auxiliary equipment, availability and reliability, measurements and control, manufacture, erection, and inspection are covered. Special attention is given to recovery boilers and fluidized bed boilers, and automated design and dimensioning calculation spreadsheets are available for download at the book’s companion website. This book is intended for both design engineers and steam boiler operators, as well as those involved in plant management and equipment purchasing. Esa Kari Vakkilainen is a graduate of Lappeenranta University, Finland, where he now works as professor of Sustainable Energy Systems. His professional career focuses on steam boilers especially combustion of biofuels. When fluidized beds were commercialized he worked in boiler industry especially for steam generator thermal design. In addition to CFB, Professor Vakkilainen has been involved with biomass boilers such as Kraft recovery boilers as Research Manager and Technical Manager. Before his current position in academia, he was employed by Jaakko Pöyry Oy, International consultants to pulp and paper as leading technology expert – energy and environment. Esa Vakkilainen has lectured on boilers at all major continents and been chairman of several international technical conferences. This book is useful in that there are few books specialising in biomass boilers. I should point out that I have met the author a couple of times (once in Finland)-he is a leading process specialist in chemical recovery boilers. I am a keen follower of his work. His publications are of a very high quality.